We got up at 8:30 a.m., showered, and went to breakfast. At 9:45 a.m. we left the hotel, and walked to the Hungerford pedestrian bridge, where we crossed the Thames River and walked to the London Eye. 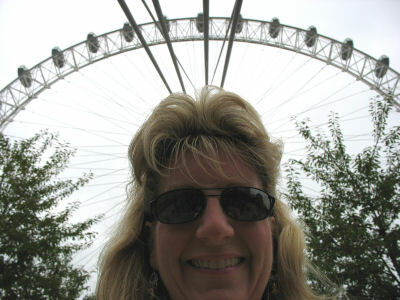 About three weeks prior to our trip, we pre-booked tickets online for the British Airways London Eye. I would recommend booking in advance to avoid disappointment. 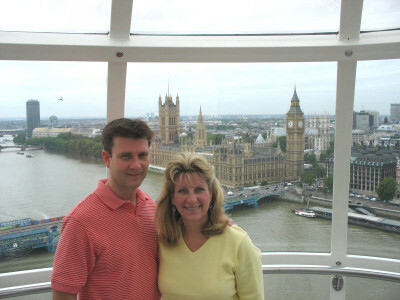 The London Eye is very popular, and “flight” times fill up quickly. Depending on the specials being offered, booking online may save you 5-10%. When you book your ticket, you choose a flight time, and you should be there about 30 minutes prior to that. The London Eye is the largest observation wheel in the world, topping out at 443 feet (135 meters). I call it a Ferris wheel, but they like to call it an observation wheel. It was built to celebrate the turning of the millennium and has become a hugely popular attraction and iconic symbol of London’s new skyline. While the Eye was only intended for a five year run, it looks as though it will be a permanent resident of London. Thirty two flight capsules surround the wheel, representing the 32 boroughs of London. Each air-conditioned capsule holds up to 25 people. Bench seating is available in each capsule. To get our tickets, we had to go inside the building across the walkway from the ride. Inside the building there were several lines for purchasing and/or claiming pre-booked tickets. The lengthy queues were empty, but I can see why during the busy season you would want to pre-book. We had booked a ticket which included a live guide on our flight who would discuss and describe various points of interest during the ride. The cost for this “discovery flight” was an extra 2 pounds per person. Pre-booked tickets for a flight without a guide were £13. So we paid £15 each for the ride. There was a special line for claiming your pre-booked discovery flight ticket. We were given tickets, and directed to wait in a room until the discovery guide came to get us. Over the next few minutes, several other people joined us in the waiting room. Finally, the guide came into the room and took us outside to a special entrance for people going on a discovery flight. I guess this may have saved waiting time, had there been a lengthy line. Security was checking bags, as the Eye would conceivably be a high profile target for terrorists. The wheel turns very slowly, and does not come to a complete stop when you get in or get out of the capsules. The operators will stop the wheel for elderly or handicapped individuals. I was very impressed with the efficiency of the operation. We all filed on board, and the door closed behind us. As we began to rise above the skyline, our discovery guide began describing different buildings and points of interest. I was a little disappointed that our guide had a very strong accent, and was a bit difficult to understand. It sounded like she was from Russia. The flight lasts 30 minutes, and our guide narrated for most of that time. 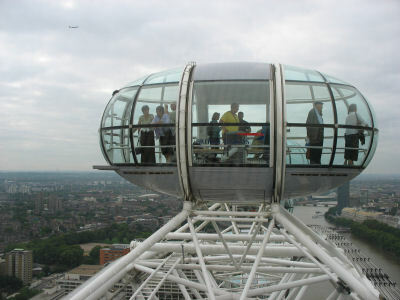 We freely roamed around the entire capsule, and got a 360° view of London. Our guide offered to take pictures of anyone who wanted them, and this afforded Susan and me a chance to be in a picture together. As we approached the end of the ride, our guide informed us that we would be able to get our picture taken by the camera permanently attached near the base of the wheel. If you have ever ridden a roller coaster or other amusement park ride, you are probably familiar with the cameras that take your picture mid-ride. When you get off, you can see your picture on a screen, and choose to pay for a print of the shot. So we watched carefully for the location of the camera, and made sure to smile for it. The capsule reached the bottom, the door opened, and we disembarked. As we walked out, we looked at the screens showing the pictures. We decided we liked the picture, and Susan purchased that for £7.50. After the ride, we debated where to go next. 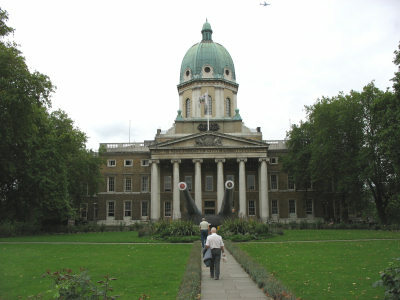 The Imperial War Museum was located on this side of the river, and one of the maps we had showed that it was very close to where we were. So, in spite of Susan’s hurting foot, we started walking in the direction of the museum. What we didn’t realize was that the map was not drawn to scale. Because the War Museum was actually just off the map, the map designers had obviously taken liberties and placed the icon for the museum on the map, so that it could be included. After we had returned to Atlanta and were looking at a more accurate and complete map, we realized just how far out of the way we had gone. But, we did get some exercise, and saw a different part of the city. 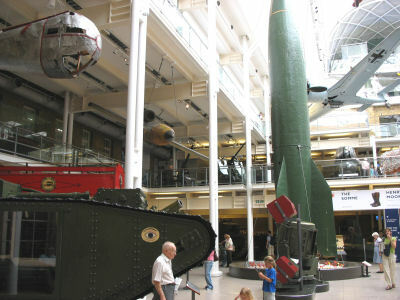 The War Museum is located in an area that is not a touristy place. After walking for about 30 minutes, we reached the museum around 11:45 a.m. Admission to the museum is free, although they do welcome donations. Photography is permitted except in the Holocaust Exhibition and the art galleries. This really is a spectacular museum. The breadth and depth of information and items on display kept us occupied for the next three hours. I was particularly fascinated by the captured V2 rocket. Susan enjoyed seeing the room devoted to General Montgomery, which had many of his medals on display. The Holocaust Exhibition is a sobering reminder of the reason we fought to defeat Hitler. Kids should have fun visiting the museum as there are a number of exhibits made for the little ones. I hope that today’s youth will visit this type of museum so that they can appreciate the freedoms that they enjoy and be respectful and thankful for those who sacrificed during the war. When we had finished looking through the museum we spent a few minutes walking through the gift shop, then went into the café and purchased a Diet Coke. Once again Susan had brought some snacks with us and we ate those.